Chassisworks' g-Link FAB9™ offers exceptional performance, reliability, and adjustability in a bolt-on, factory-welded housing, complete with all suspension brackets. Housings are engineered for proper clearance using either VariShock coil-over or air-spring suspension; with or without a back brace. Anti-roll-bar bracket options include chassis-mounted (sliding-link bar), axle-housing mounted (splined-end bar), or no anti-roll-bar brackets installed. Narrowed HousingsThe versatility of the FAB9™ housing allows you to choose from standard stock widths or specialty housings that enable use of extremely wide tire and wheel combinations. 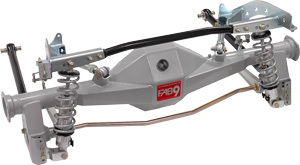 Mini-Tub FAB9™ - Lower axle brackets and control arms are moved inward to allow more room for deeper backspaced wheels on mini-tub equipped vehicles. Narrowed Widths - End-to-end housing widths can be narrowed in 1/4" increments to allow deeper outside wheel lips and adequate fender clearance. Complete correct length axle packages and third members are also available. Ask our sales representatives for details.